I saw an interesting post on Laughing Squid about what was fairly certainly the visual inspiration for The Joker, nemesis of one Batmaing... er Batman. 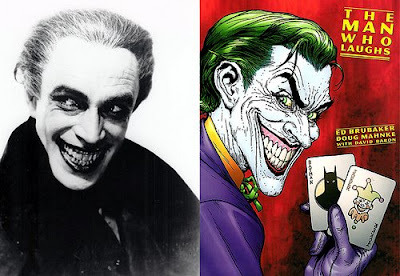 The "creators drew their visual inspiration from German actor Conrad Veidt’s portrayal of the character Gwynplaine in the 1928 film The Man Who Laughs. An adaptation of a Victor Hugo novel, the film was directed by German expressionist filmmaker Paul Leni, with Veidt in the title role." Check out the post for more info and pics.